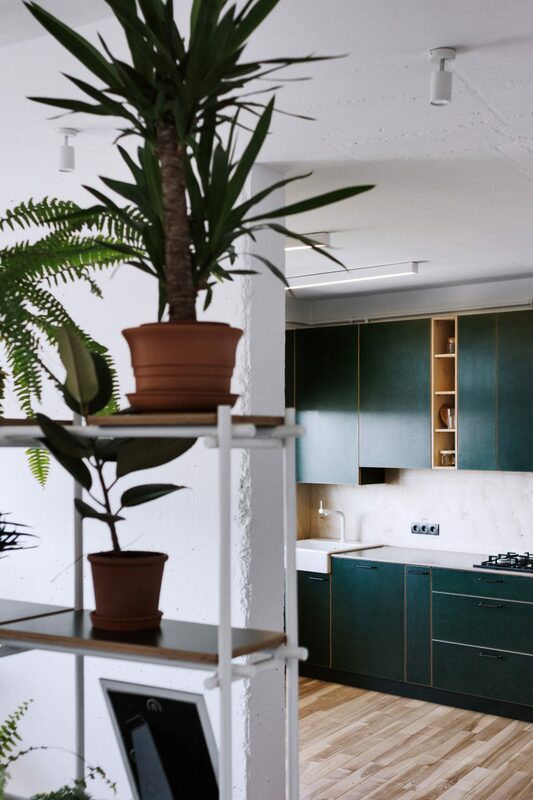 A kitchen decked out with forest-green plywood cabinets and a shelving unit filled with plants add colour to this otherwise simple apartment in Ukrainian city Lviv, by interior designer Roman Shpelyk. 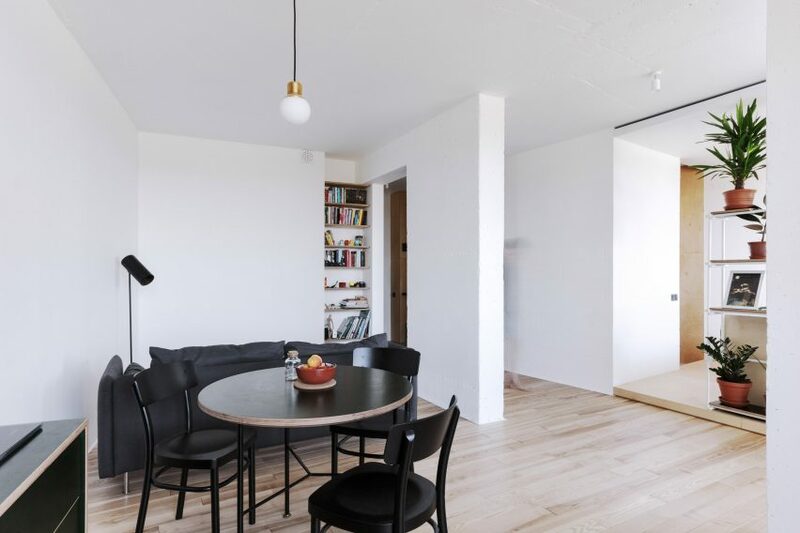 Apartment #149 is the home of a young couple, who asked Shpelyk for an inexpensive overhaul of their living spaces, to make it feel roomy. 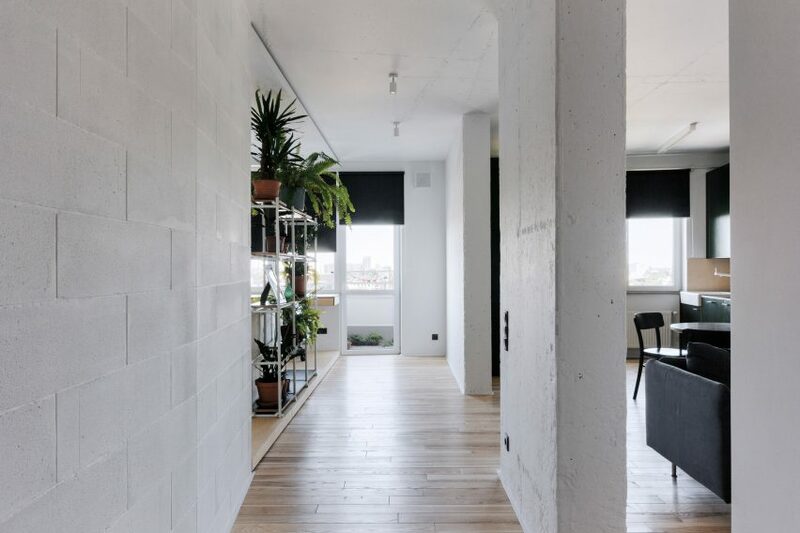 Shpelyk and his team refrained from creating closed off rooms, so that the apartment appears more spacious. They left many surfaces in their natural condition, and employed cheap materials to create any new additions. Concrete columns retain all their original lumps and indents, while new walls have been created using inexpensive blockwork. The only flashes of colour come from the new kitchen and the plant-covered partition. 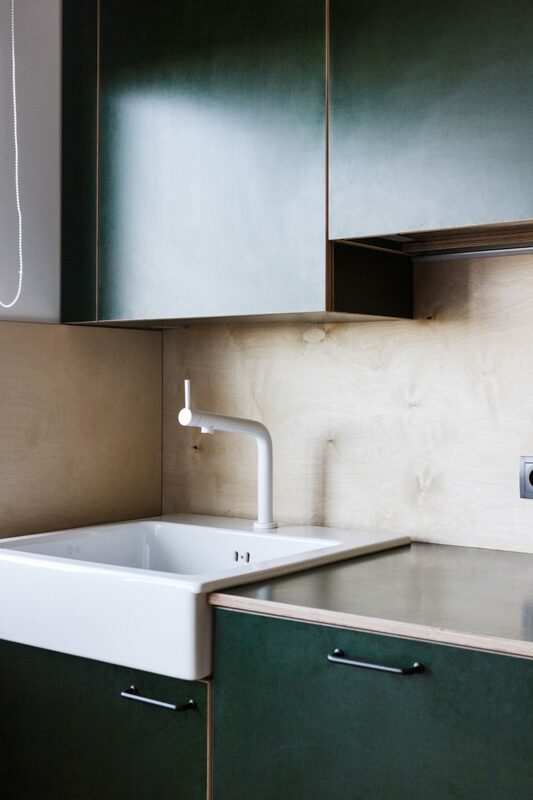 The kitchen features laminated plywood cabinetry, coloured in a shade of forest green, which Shpelyk says “creates a delicate accent and revives the interior with colour”. It is a technique that has also recently been used on a home in London, which features a yellow kitchen, and a Porto flat, which has a blue kitchen. “The materials we used in this project gave us the opportunity to create interesting texture contrasts, which enriched the interior visually” he said. 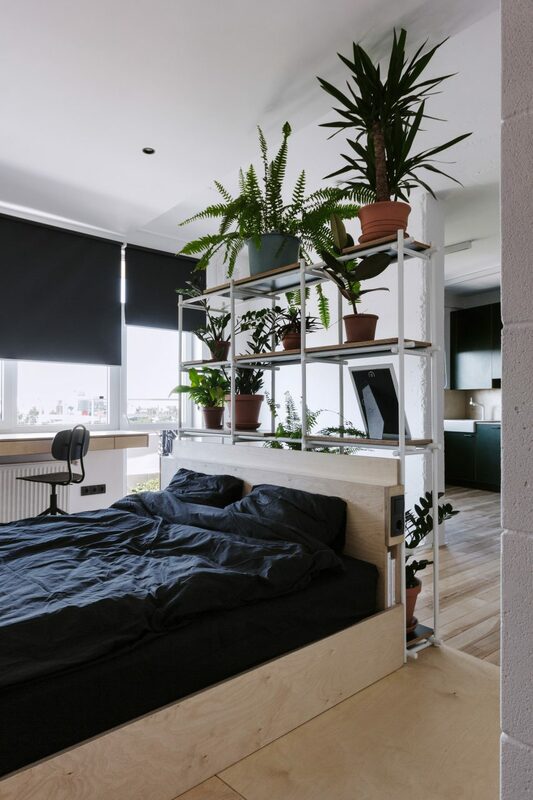 Similarly, the plant-covered shelving unit creates a see-through partition between between the bedroom and the main living spaces – and echoes the hue of the kitchen, located just opposite. Lined with potted plants, it offers some privacy for the bedroom area, but doesn’t close it off completely. The bed is slightly raised up on a platform to offer further separation. The room also features a small workspace, provided by a birch plywood desk slotted beneath a window. “I would say its quite fascinating to think over every meter of the apartment and how it will be used,” said Shpelyk. “In small apartments you have to think of every detail”. Other details include black furnishings and an ash wood floor. “We adore this type of wood,” added Shpelyk. There is also storage space for bicycles, provided by hooks attached to the walls. Photography is by Yuriy Salabay.